The only description needed of the new Fantagraphics graphic novel, Patience, can be found in the one line printed under the title on the back cover: “A COSMIC TIMEWARP DEATHTRIP TO THE PRIMORDIAL INFINITE OF EVERLASTING LOVE BY DANIEL CLOWES.” It sounds more sensational and psychedelic than Clowes’ usual work, and it is, but those fantastic elements are used in service of a story that is firmly in line with the introspective, character-driven comics Clowes has created in the past. The “cosmic timewarp deathtrip” aspect allows Clowes to move in a more experimental, surreal direction with certain elements of his plot and artwork, but it’s all grounded in a relatable human emotion: love. That foundation makes for a surprisingly upbeat read given how dark the story gets, and the suffering of Clowes’ characters is ultimately balanced by the elation of everlasting love. Patience is rooted in the experience of Jack Barlow, a man fixated on finding the killer of his late wife, Patience, and their unborn child. When he discovers a way to travel back in time, Jack goes to the past to save Patience’s life, learning his late wife’s traumatic backstory and confronting his own origins in the process. The book begins by focusing on Jack and Patience’s domestic issues in 2012, establishing their personal relationship and the growing tension caused by their anxiety over the financial and personal responsibility of having a child. These scenes are shown from Jack’s perspective, emphasizing his disappointment that he can’t be a better husband to his wife and his fear over the fate of his baby, feelings that Clowes has plenty of experience exploring in his work. 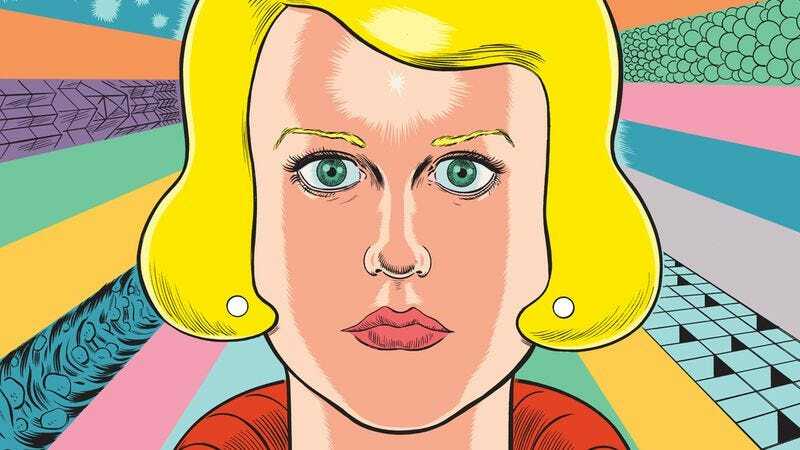 Clowes begins by working within a style and tone that he, and his readers, have become accustomed to, but then he drops the murder twist, shattering Jack’s life to take the story in a new direction. Those early years of Jack’s investigation are still aligned with Clowes’ noir-tinged past projects like David Boring and The Death-Ray, but there’s a drastic shift when the plot jumps to 2029, resulting in a complete overhaul of Clowes’ design sensibility, a bright, candy-colored palette, and the introduction of the sci-fi elements that open another new story path for Clowes to explore. Jack becomes increasingly obsessed with Patience and tracking down her killer over the course of that narrative transition, and by the time he ends up in the past, he’s given himself over completely to his mission to save his late wife. Jack’s obsession with Patience is captured in the front cover image, offering a close-up shot of Patience’s flawless face staring blankly ahead as various textures, patterns, and colors come bursting forth from around her head. It’s not the living, breathing Patience that appears in this book’s pages, but a pristine, mannequin-like image that has been polished by Jack’s memory, an idealized portrait that is thrust toward the reader by the aggressive background. Patience is at the forefront of Jack’s thoughts and actions for the entire story, and the cover forcefully imprints her face in the reader’s mind. The first two pages show Jack and Patience entirely in silhouette, but the cover has already filled in one of these faces to create a greater sense of intimacy between the reader and Patience in those initial moments. The front cover depicts Patience as a lifeless object rather than a fully formed person, an idea that comes into play at the start of the story. Patience and her unborn child are killed early on, and at first it looks like the title character’s main role is to be the corpse that fuels her husband’s vengeance. Once Jack discovers time travel, though, the story shifts focus to show Patience’s life in 2006, six year before her murder. A college dropout moving back in with her mother and deadbeat stepfather, Patience is looking for a nice guy after dating a string of assholes, but unfortunately her luck hasn’t gotten much better. Patience is constantly abused by the men in her life, and as Jack witnesses this mistreatment, he interferes in ways that complicate his greater mission and Patience’s future, creating shockwaves that impact Patience’s relationship with the Jack she meets in real time. The glimpse into Patience’s life before Jack adds significant dimension to her character, and she becomes even more captivating when the story catches up with her in 2012, shortly after she learns that she’s pregnant. Confused by the inexplicable events that transpired when a time traveler briefly entered her life six years ago, Patience is keeping her own secrets from Jack, and Clowes revisits key moments from the start of the story to show how Patience looks at her marriage and impending motherhood. She begins as a corpse, but by the end of the graphic novel, Patience is a complex, multi-faceted character with her own distinct strengths, weaknesses, and desires. Patience’s yellow hair is an important visual motif throughout the story, linking her to other yellow-haired characters while also making her the center of attention whenever she appears. As the lightest, brightest hue on the color spectrum, yellow has positive emotional associations with happiness, inspiration, and hope, but it’s also connected to disease, danger, and cowardice. Clowes explores all these different characteristics of the color in Patience, starting by assigning the positive qualities to Patience via her hair color. After the opening two pages of silhouettes, Clowes shows two front-facing headshots of Jack and Patience; Jack’s panel has a bright yellow background that is accompanied by text that includes the words “happy,” “overjoyed,” and “ecstatic,” and the proceeding panel with Patience transfers that yellow color and all it connotes to her hair as she stands before a gray background. On the negative side, the fliers Jack shamefully hands out on the street are yellow, moments of weakness are highlighted with yellow, and his violent hallucination of Patience compelling him to kill the mother of her potential killer is yellow. By associating yellow so heavily with Patience, Clowes brings her into the story every time the color appears, even if she’s not on the page. When Jack ends up in his childhood time period and looks out at a gray and brown city accented with glowing yellow windows, Clowes visually draws a connection between Jack’s upbringing and his future wife, a connection that becomes even stronger once he reveals Jack’s mother and her yellow hair. As Jack is thrust throughout the time stream, he begins to suffer intense side effects that alter his perception, resulting in some stunning visuals as Clowes experiments with shapes, colors, and perspective. The covers (front, back, and inside) tease these bold graphic moments, and when they arrive in the narrative, they expand the scope of the story with flashes of cosmic chaos in the context of a personal story about coming to terms with the past and opening up completely to another person. These hallucinogenic sequences highlight Jack’s mental degradation, but by the end of the story they gain deeper meaning as Clowes unwinds the fabric of the universe to explore how Jack and Patience’s love fits in the grand tapestry of infinity.